We support our local library and help with needs at a local school and also a school in Labrador. We supply scholarships to help students further their education and greatly enjoy the feedback we receive from the students we help. The needs of our community are varied. We have supplied support to Hestia House ,Fresh Start ,needy Christmas families ,Portage, Ridgewood Veterans Wing, Saint John Regional Hospital, Romero House and our local food bank. Each Remembrance Day we place a wreath at our Cenotaph. We welcome new citizens and supply aid to local veterans. 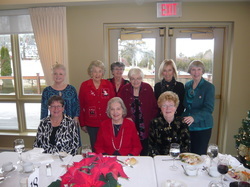 Our chapter was first formed in 1919 as a response to post war needs in the community. Although, throughout the years we have supported national and international needs, our favorite activities are those we do locally. For example, our chapter was instrumental in providing the Cenotaph on the Rothesay Common where we annually place a wreath of remembrance. We, as a group can have a real impact on our community and welcome new members to help us accomplish this.